JNJ Burger Shack was just that...a shack--with a kitchen and a cash register on one side and a BBQ joint on the other side. The journey with Colonel Mustard, Side Of Fries, and Pepsi Max took us to the burger side. Outdoor seating--plastic chairs and tables--gravel underfoot--a tent-like awning to protect diners from hungry birds and the elements. JNJ Burger Shack had a very backyard feel to it. The principle sound heard in the background was our lunch sizzling on the griddle--just like a backyard BBQ. The service was friendly and courteous, and they nailed the order from drinks to fries. 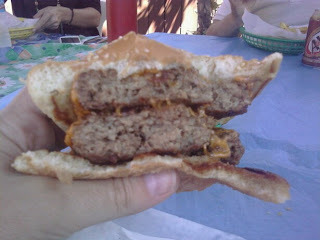 ﻿ The JNJ Cheeseburger was a monster--two 1/3 pound patties and two slices of cheese. It was a lot of cheeseburger for 5 bucks. The Beef: A conversation with the owner (?) 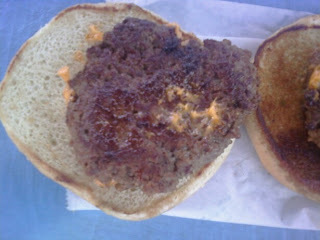 revealed that they used the "Johnny Rockets" blend of ground beef for their burgers as ordered from the supplier. It tasted of 80:20 ground chuck with some rib meat cut in to add funk and depth. Further, there was something aged in there to deliver a tasty front note. The Sear: Magnificent, crunchy, deep, dark, and hearty all accurately described what happened there. The Preparation: The irregular patties were shaped loosely and by hand, but there was a binder in there (egg?) which created a firm bite in spite of the gentle handling of the medium-coarse grind in creating those loosely formed patties. This meant that the burger was cooked to Well Done on the small, crazy-hot griddle, since raw egg in a cheeseburger would have been nasty. That was OK, because that binder served to preserve the moisture, which would have otherwise vaporized. It had a bit of a meatloafy, damp chewiness to it, and that was welcome in a Well Done burger, which would have been crumbly or rubbery otherwise. The Seasoning: Finally--seasoning both inside and out. They hit it with a proprietary blend of spices, all of which served to highlight the beefy and aged notes of the quality blend. 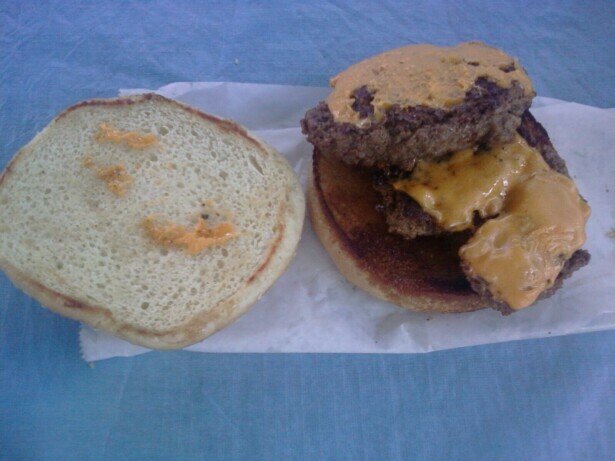 The Cheese: Nicely melted American--they melted the cheese onto the patty while it was still on the grill. The Bun: A big, fresh, moist, floppy, seeded, standard, hamburger bun, which was oiled (not buttered) and grilled brown and crispy. The crunch of the bun really tied into the crispness of the sear and the creaminess of the cheese. 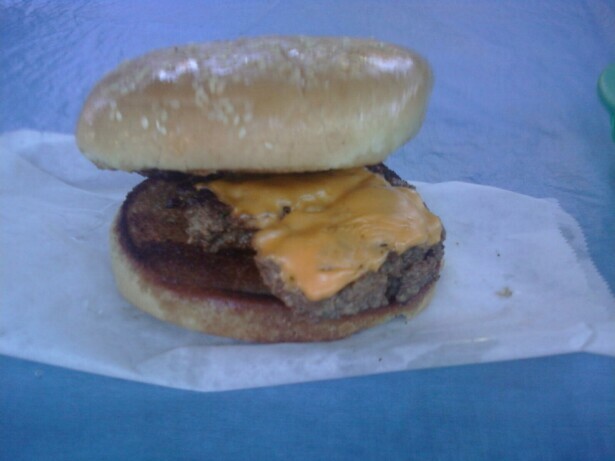 Note that the bottom bun was beautifully toasted, presumably to catch any drippings from the burger patty. Meat to Bun Ratio: I didn't finish my bun, because I wanted to enjoy the meat and cheese by themselves. The ratio was skewed to the bun. This cheeseburger didn't actually ooze much juice due to the preparation, so a less mighty bun would have sufficed. The Fries: Damned tasty and crispy. JNJ Burger Shack served one of the best burgers that we have tried in Los Angeles. The value was remarkable, and the quality was strong. I am glad that it is close to my house so that I can go more often. Burger Review : It's a monster, but it's so good that you can't help but finish it. A damn good burger.